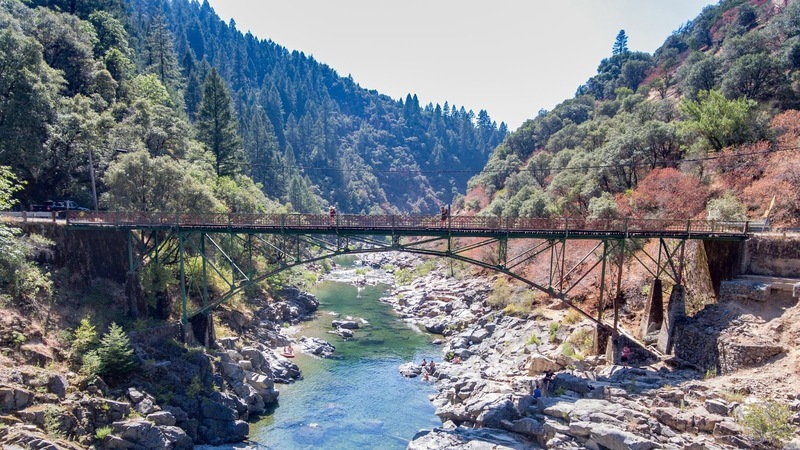 Mr. Isaac Jones from Nevada City discovered half a jaw bone with three intact golden teeth while metal detecting near Edwards Crossing, a historic bridge which gold prospectors mining for gold in the area used to cross the Yuba River. The remains have been turned over to Nevada County Sheriff. Captain Paul Schmitt said that they will be sending it to a forensic anthropologist. It can take up to 6 months for scientists to determine the age and if there is DNA or dental records. It is possible that this could be the remains of an old miner or a missing person and may possibly bring closure to a grieving family. 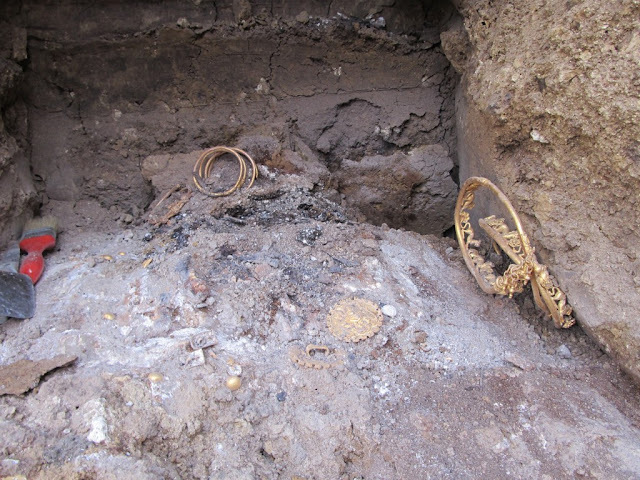 Gilded bronze and silver-plated mounts from a horse bridle have been discovered in the town of Hørning near Skanderborg in Jutland, Denmark along with the remains of a Viking to whom these artifacts belonged to. 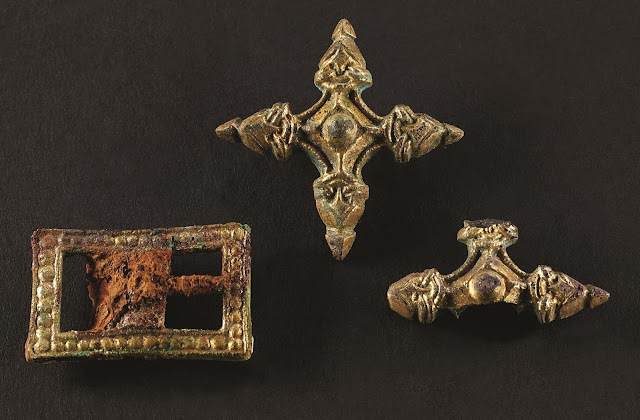 The find consists of two cross-shaped fittings and a rectangular buckle. They are now on display at the Museum of Skaderborg. The Museum of Skanderborg archaeologists has secured funding for a full excavation of the area including a huge grave complex, which is unusually large for the time period. 3 Year old James Hyatt from Billericay, Essex wanted to join his father and grandfather metal detecting and a trip planned out on a field in Hockley, Essex seemed like as perfect opportunity as any to have his first ever try at treasure hunting. Within minutes of taking hold of the metal detector, there was a distinctive beep, indicating a non-ferrous target buried in the ground. He started digging and much to the astonishment of everyone unearthed a gold locket which was not a modern piece of jewelry. Experts identified it as a reliquary and dated it to the era of Henry VIII (early 16th century), the engraving is a type which was popular during that time. Gold coins of significant value were discovered during a search in a recently drained, man-made lagoon on Namibia's coast near Oranjemund. The area where the treasure was found, is located close to an old mining site, which is in the surf zone, where the incoming waves made mining impossible, so miners pushed up a huge sea-wall with bulldozers parallel to the beach, with the ends running back to the beach, resulting in a large man-made lagoon, sheltering the site from the pounding surf. The following day after the discovery of the gold coins, bits of metal, pipes and other parts of a ship was found and it was then rather certain that a shipwreck should be located close by. Shortly following this, a startling discovery was made. A ship, loaded with $13,000,000 worth of gold and other valuables lay buried under the ocean floor. Searches of the Namibian shoreline turned up many finds in relation to ships which got lost at sea and this has been a very significant find. Medieval ring found in Robin Hood's Sherwood Forrest. Mr.Mark Thompson was metal detecting in Sherwood Forest, in Nottinghamshire, where the legend of Robin Hood originates when he discovered a beautiful gold ring set with a blue sapphire stone. 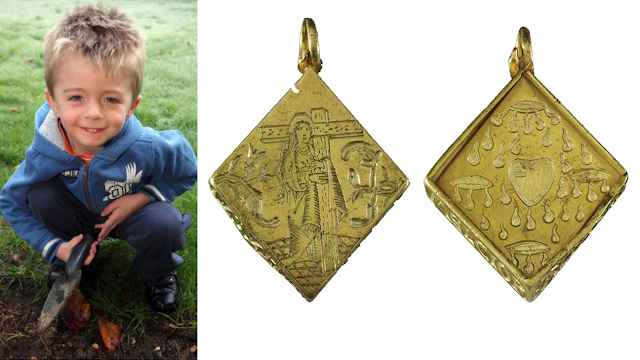 It has the image of an infant Christ engraved on one side and that of a Saint on the other. It is believed to date from the 14th century and similar to one found with the tomb of Archbishop of Canterbury, William Whittlesey, who died in 1374. A regional finds liaison officer, Dot Boughton, confirmed that the case has been referred to the coroner to be formally declared a treasure, following tests at the British Museum. 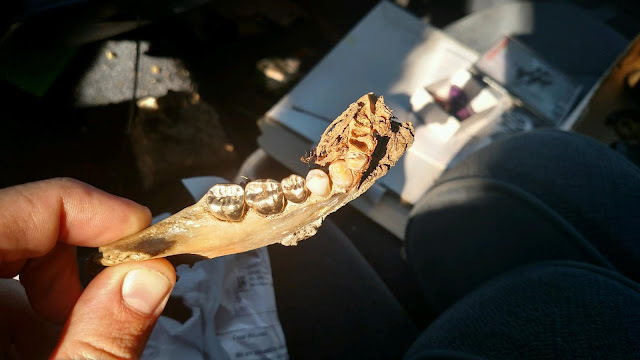 Mr. Thompson says that he found the ring within 20 minutes while searching with his metal detector in the forest and making this find could completely change his life. Adam Day is a 30-year-old metal detecting enthusiast from Yorkshire. 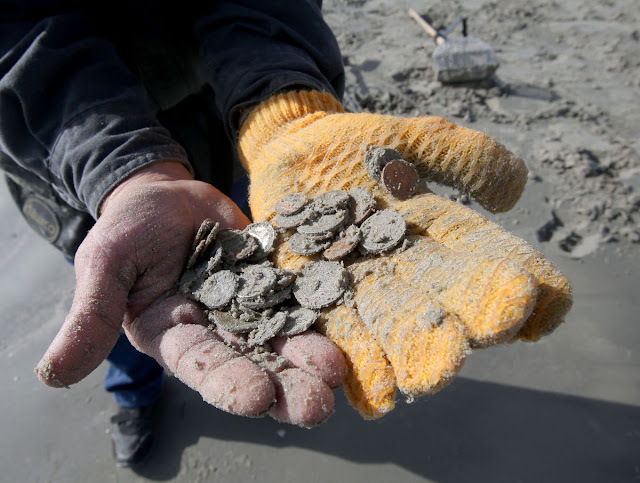 He recently started a metal detecting hobby and is considered to be an amateur treasure hunter. Never did he consider his newfound hobby would bring him fame and fortune so soon. During a search on a farmer's plowed field near Beverley Minster in Yorkshire, he came upon an amazing discovery, a 15th-century bishop's ring made of 20-carat gold. He recalls the moment when first looking at the ring he just pulled out of the ground and realized it was of significant value and says that he was shaking at the thought of what special piece of jewelry was right there in his hands. Largest hoard of Roman coins - Wold Newton Hoard. 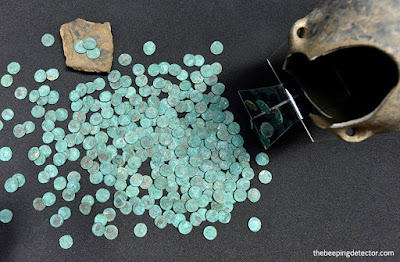 Mr. David Blakey from Hartlepool, United Kingdom, discovered the largest hoard of Roman coins one morning while he was searching on a field in Wold Newton, East Yorkshire. He almost did not make the discovery, as he was just about to go for lunch and a rest following an unproductive morning, when his metal detector sounded as it was moving over the target. Named the Wold Newton Hoard, it contains an astonishing 1.857 Roman coins and dates around 307 CE, featuring coins representing Constantius and also the first coins to proclaim his son, Constantine, Augustus following his instatement as emperor of York. The haul is believed to have been the equivalent of an annual salary for a Roman soldier in that era. It has been evaluated to be worth £44,200 today. The curator of numismatics at the Yorkshire Museum, Mr. Andrew Woods, said that the find is absolutely stunning and has an irrefutable connection to one of the most significant periods in the Roman history of York. 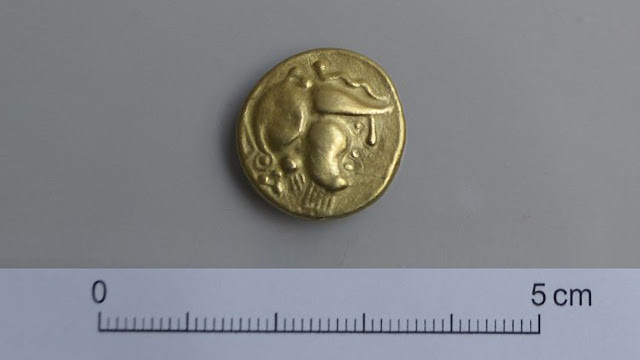 A field in Bela Krajina, which was initially farmland, delivered a surprise find of an extremely rare golden Celtic coin dating back to 3rd century BC, which has only been found elsewhere in Europe before. It was attached to a bronze belt which was not intact enough to restore, but organic material preserved on the belt could potentially provide the possibility of carbon dating. The condition of the coin itself is well preserved. Ceramics and iron weapons found in close proximity initially indicates the date to be around 3rd century BC. It is the oldest coin found in Slovenia and a Celtic imitation of an Alexander the Great stater which features on one side an image of the goddess Nike and the other that of Athena. 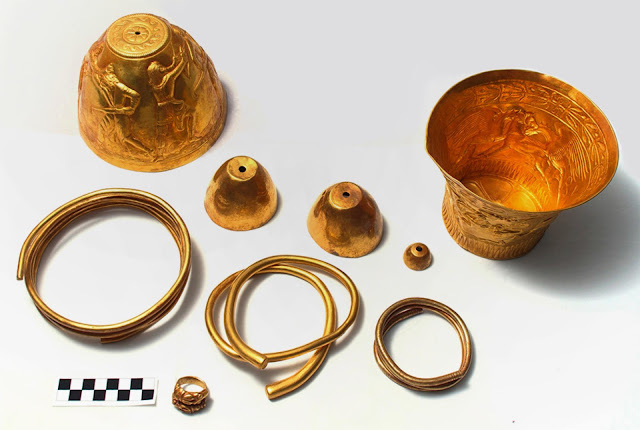 Several, very valuable and beautifully preserved golden artifacts were discovered with the help of metal detectors at the village of Sveshatari, Bulgaria, 400 km northeast from the capital, Sofia. The find was made near Omurtag mount where the largest of 150 Thracian thombs of the Getae tribe was found in 1982. This tribe was associated with ancient Greeks. The Sveshatari tomb is considered significant and included in the World Heritage List of U.N. education and culture agency, UNESCO, for its unique architectural decor. The find consists of 264 unique gold adornments and dates back to the 3rd or 4th century BC. Fragments of a wooden box, containing charred bones and ashes, along with, among others, all gold items consisting of a tiara decorated with animal motifs, a horse head piece, four spiral gold bracelets, a ring, several female figurines, believed to have decorated clothing, buttons and beads.